NIAGARA... THE WONDER OF IT ALL! Click here to download the signup form. Your trip to Toronto would not be complete without a visit to the breathtaking Niagara Falls! Enjoy insightful commentary en route to Niagara including historical, cultural and geographical highlights of this spectacular region. The Falls is truly a Canadian jewel. The thunder of Niagara Falls draws tourists from all over the world. Six million cubic feet of water crash over the Horseshoe Falls Crestline every minute! Upon arrival in Niagara, enjoy a historical ride aboard the world famous Maid of the Mist. This powerful diesel-powered boat will cruise past the base of the American Falls, and then on to the basin of the magnificent Canadian Horseshoe Falls. Water rushes all around as you "soak" in the excitement and feel the thunder of the Falls. It's a thrill of a lifetime! After this fabulous boat ride, guests will have some free time to do a little souvenir shopping before proceeding to the new Elements on the Falls Restaurant to enjoy a delicious three course lunch while overlooking this natural wonder. After lunch, guests will proceed to the world-class winery, Hillebrand Estates Winery. Hillebrand celebrates over 25 years of winemaking excellence and is a true Icewine pioneer. In 1983, Hillebrand became the first Niagara winery to produce this rare Canadian treasure. Today, your guests will tour this winery and learn how Icewine has become legendary through precise temperature, hand-harvesting, tender pressing and oak aging. The tour will end with a tasting of three wines from the cellar . 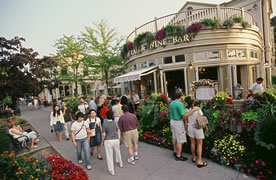 Our final destination will be a stop at the picturesque, 19th century town of Niagara-on-the Lake. Sir Winston Churchill described this route as the "prettiest Sunday afternoon drive in the world." One of the oldest settlements in Ontario, the town has been restored beautifully to depict its heritage. Your guests will have the opportunity to browse through the picturesque craft stores and specialty shops that can be found on every corner before heading back to Toronto. Niagara Falls is truly special - your camera is a must! All applicable taxes and gratuities.